The Vedas are a large body of Hindu texts originating in ancient India, with its Samhita and Brahmanas complete before about 800 BCE. Composed in Vedic Sanskrit hymns, the texts constitute the oldest layer of Sanskrit literature and the oldest scriptures of Hinduism. Hindus consider the Vedas to be apauruṣeya, which means "not of a man, superhuman" and "impersonal, authorless". The knowledge in the Vedas is believed in Hinduism to be eternal, uncreated, neither authored by human nor by divine source, but seen, heard and transmitted by sages. The Upanishads are commonly referred to as Vedānta, variously interpreted to mean either the "last chapters, parts of the Veda" or "the object, the highest purpose of the Veda". The concepts of Brahman (Ultimate Reality) and Ātman (Soul, Self) are central ideas in all the Upanishads, and "Know your Ātman" their thematic focus. The Upanishads are the foundation of Hindu philosophical thought and its diverse traditions. Of the Vedic corpus, they alone are widely known, and the central ideas of the Upanishads have had a lasting influence on Hindu philosophy. 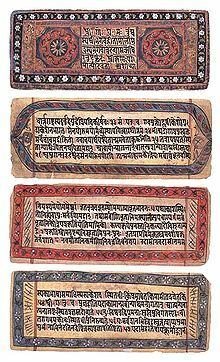 The Sutras and Shastras texts were compilations of technical or specialized knowledge in a defined area. The earliest are dated to later half of the 1st millennium BCE. The Dharma-shastras (law books), derivatives of the Dharma-sutras. Other examples were bhautikashastra "physics", rasayanashastra "chemistry", jīvashastra "biology", vastushastra "architectural science", shilpashastra "science of sculpture", arthashastra "economics" and nītishastra "political science". It also includes Tantras and Agama literature. The Nalayira Divya Prabandha (or Nalayira (4000) Divya Prabhamdham) is a divine collection of 4,000 verses (Naalayira in Tamil means 'four thousand') composed before 8th century AD , by the 12 Alvars, and was compiled in its present form by Nathamuni during the 9th – 10th centuries. The Alvars sung these songs at various sacred shrines. These shrines are known as the Divya Desams. The Hindu scriptures provide the early documented history and origin of arts and sciences forms in India such as music, dance, sculptures, architecture, astronomy, science, mathematics, medicine and wellness. Valmiki's Ramayana (500 BCE to 100 BCE) mentions music and singing by Gandharvas, dance by Apsaras such as Urvashi, Rambha, Menaka, Tilottama Panchāpsaras, and by Ravana's wives who excelling in nrityageeta or "singing and dancing" and nritavaditra or "playing musical instruments"). The evidence of earliest dance related texts are in Natasutras, which are mentioned in the text of Panini, the sage who wrote the classic on Sanskrit grammar, and who is dated to about 500 BCE. This performance arts related Sutra text is mentioned in other late Vedic texts, as are two scholars names Shilalin (IAST: Śilālin) and Krishashva (Kṛśaśva), credited to be pioneers in the studies of ancient drama, singing, dance and Sanskrit compositions for these arts. Richmond et al estimate the Natasutras to have been composed around 600 BCE, whose complete manuscript has not survived into the modern age. ^ These include rebirth, karma, moksha, ascetic techniques and renunciation. ^ a b Ramdas Lamb (2002). Rapt in the Name: The Ramnamis, Ramnam, and Untouchable Religion in Central India. State University of New York Press. pp. 183–185. ISBN 978-0-7914-5386-5. ^ a b Patrick Olivelle (2014), The Early Upanisads, Oxford University Press, ISBN 978-0-19-535242-9, page 3; Quote: "Even though theoretically the whole of vedic corpus is accepted as revealed truth [shruti], in reality it is the Upanishads that have continued to influence the life and thought of the various religious traditions that we have come to call Hindu. Upanishads are the scriptures par excellence of Hinduism". ^ a b c Wendy Doniger (1990), Textual Sources for the Study of Hinduism, 1st Edition, University of Chicago Press, ISBN 978-0-226-61847-0, pages 2–3; Quote: "The Upanishads supply the basis of later Hindu philosophy; they alone of the Vedic corpus are widely known and quoted by most well-educated Hindus, and their central ideas have also become a part of the spiritual arsenal of rank-and-file Hindus." ^ Gavin D. Flood (1996). An Introduction to Hinduism. Cambridge University Press. pp. 37–39. ISBN 978-0-521-43878-0. ^ a b Olivelle 1998, p. xxiii. ^ Mahadevan 1956, p. 56. ^ King & Ācārya 1995, p. 52. ^ Varghese 2008, p. 101. ^ Ananda W. P. Guruge, 1991, The Society of the Ramayana, Page 180-200. ^ a b c Natalia Lidova (1994). Drama and Ritual of Early Hinduism. Motilal Banarsidass. pp. 111–113. ISBN 978-81-208-1234-5. ^ a b Farley P. Richmond, Darius L. Swann & Phillip B. Zarrilli 1993, p. 30. ^ Tarla Mehta 1995, pp. xxiv, xxxi–xxxii, 17. Collins, Randall (2000). The Sociology of Philosophies: A Global Theory of Intellectual Change. Harvard University Press. ISBN 0-674-00187-7. MacDonell, Arthur Anthony (2004). A Practical Sanskrit Dictionary. Motilal Banarsidass. ISBN 978-81-208-2000-5. Olivelle, Patrick (1992). The Samnyasa Upanisads. Oxford University Press. ISBN 978-0-19-507045-3. Radhakrishnan, S.; Moore, C. A. (1957). A Source Book in Indian Philosophy. Princeton, New Jersey: Princeton University Press. ISBN 978-0-691-01958-1.